Notes: The Carey Bugger is a variation of the Carey Special, a streamer pattern developed within the Kamloops area of British Columbia. The pattern is popular within the Sierra as a damselfly nymph and small fry imitation in stillwater conditions. 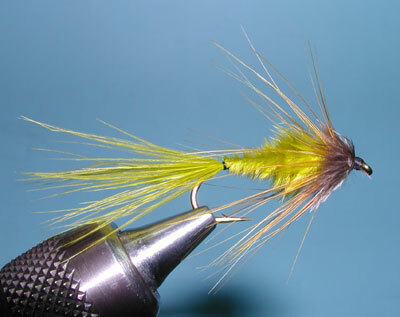 It can also be used as a wet fly or streamer within streams. 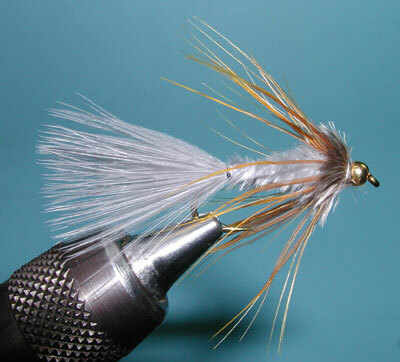 The Carey Bugger is generally tied more sparsely than the Carey Special, with a sparse marabou tail, no more than 2 wraps of Pheasant Tail Rump, and a collar of aftershaft feather. Like the Carey Special, the Carey Bugger can have many types of materials for the body, such as Crystal Chenille, Chenille, Peacock Herl, and Marabou. The aftershaft feather is found behind the Rump feather. It is a very weak stem quill with fine barbules. It makes an excellent natural collar but, due to it's weakness, must be protected. The Gold Bead helps in protecting the collar as well as providing forward weight to the pattern. The Gray Carey Bugger is an excellent choice for the perch fry at Lake Crowley. 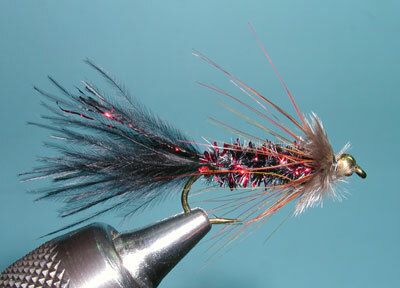 On this variation I used the tag end of the Blood marabou tail for the body by twisting the tag end and wrapping forward to the 2/3 position. It provides plenty of movement. 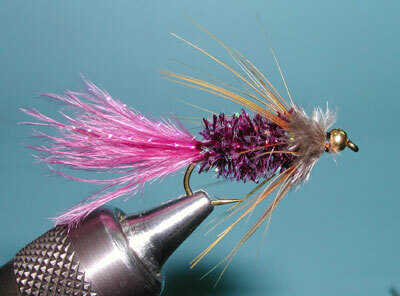 Try this wrapping technique using Light Olive Blood Marabou on the Golden Olive Carey Bugger, the body gives a good silouette of a damselfly nymph. 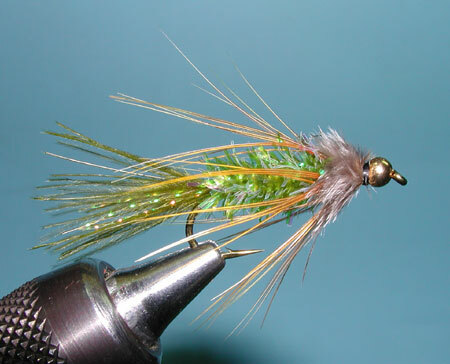 The most common way to fish the Carey Bugger in Sierran lakes, is to troll the fly on or near the bottom with a full sink line as a baitfish pattern. At other times, success can be found while trolling the fly at intermediate depths, or near the surface. When working the Carey Bugger as a Damselfly Nymph, let it sit near the weedbeds with variations in the retrieve. Short tugs of about 2 to 3 inches, or long slow pulls of about 8 to 12 inches, followed by a pause should be tried.